Why not make life more efficient and clutter-free? Since Brad Inman’s theme for the upcoming Real Estate Connect NYC 2014 is “Partner or die,” an attempt at partnering some technology products to make them more useful seems appropriate. Some are cutting-edge new and some are old, but a handful of changes in your technology habits could change the simplest of things in the next year: the bulk of your purse or back pocket. Most people would love to reduce the clutter they carry around with them. For real estate agents, the amount of gear necessary to get through a day is greater than average. Juggling phones, wallets, tablets, keycards and house keys in front of clients isn’t fun, but sometimes it feels like the only way. Start out simple: Do you need a wallet? You’ve probably seen smartphone cases that have wraparound folder enclosures, allowing the user to keep all of their usual wallet contents in the same place as their phone. Newer versions have an even sleeker style, in which the rear of the case opens up and a handful of cards can fit right into the back of the case, never obscuring the screen. For $40 you could have a wallet case like the iLID pictured above, and you could reduce one of the items you find necessary to locate and pick up every day as you leave home or the office. It sounds simple, but it might become a significant time-saver when you consider how often you’re gathering things and running out the door. Or maybe with less gear in your pockets you’ll look better in those jeans. Tile is a “coming soon” mobile app connected to small, flat square “tiles” that you can stick to just about anything. It uses low-power Bluetooth to let you track items wherever they go, from any of your devices with the app installed. 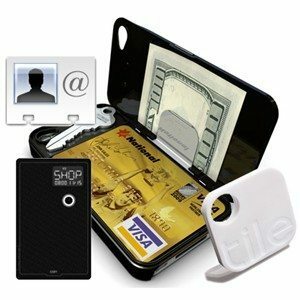 Put a tile on your smartphone wallet and another one on your tablet. When you lose either one, you can find it with the other. Add a tile to your keychain, your dog’s collar, your KeyBox keypad, your bicycle, or even your child’s phone. You’ll need only one compatible device available to find all of these items at once. Real estate agents have personal credit cards, debit cards, shared team expense cards, corporate cards, etc. It’s hard to keep them organized, but they’re all necessary at different points in time. Coin is an amazing new product that should be shipping by summer. It is a programmable credit card that allows you to store many different cards on one Coin card. The Coin card can be used in ATMs and traditional card swipe devices. The user programs in all of his or her personal credit cards and membership cards, and then can use buttons on the Coin card to select which one to use each time it is needed. There’s no need to carry the traditional credit cards any longer. The Coin card also has a built-in tracking feature, so if you install the app on your phone and leave the Coin card at a restaurant, your phone will notify you when it gets out of range. It basically has its own Tile built in. Now, you can’t lose your phone, your keys or your credit card. You still don’t need a real wallet. Remember when we said we were going to stop using cardboard business cards and do everything electronically? The vCard was invented in 1995 and it created the easiest way for us to share our contact information with each other in a way that wouldn’t get folded and dumped in a trash bin. Getting your info on someone’s phone is a connection that is likely to last a year or more, as most consumers keep their phones at least that long. How many of your business cards do you think stay in a customer’s wallet that long? Maybe you’re concerned that potential customers won’t want to give you their phone number. Luckily, you’re a salesperson. You’re not swayed by simple arguments. Ask someone, “Can I give you my card?” When they say “yes,” pull your phone out and start sending the vCard. Say, “We’re going green and we’re using paperless e-cards; I’ll send it to your phone right now, what’s your phone number?” They’ve already started down the road by saying yes. You can text or email your contact information to them, and at the same time you’re capturing their contact info for follow-up later. Seriously, it’s just a small scrap of paper. You need to have proof of automobile insurance anyway. It needs to be printed out every six months. You also have a dozen other account numbers, etc., that are important to you, so you print out a small piece of paper with those numbers on them. It may sound overly simplistic, but what happens when your phone is dead? You still need those numbers. Add your office number, the phone number of your child’s school, your emergency contact number, and anything else needed in a dead-battery emergency. Sometimes a tiny little backup sheet of printed paper is the best technology tool in your wallet. Save it on your computer. Update it every six months when you update your proof of auto insurance. Some of these products are just coming on the market and some have been available for a while, but there are always more ways to combine a bit of new and a bit of traditional technology. When a few of these ideas come together to make your life more efficient and clutter-free, it’s the best kind of partnership for productivity. Sam DeBord is a managing broker with Coldwell Banker Danforth in Seattle, state director for Washington Realtors and a real estate/technology writer for numerous online outlets. You can find his team at SeattleHome.com.